Gt. Ellingham towermill was built as a five storey tarred red brick mill and was described as newly erected in 1849. The mill originally had common sails that drove a single pair of stones. The sails were later updated to double shuttered patent sails, each with 8 bays of 3 shutters, struck by rocking lever and regulated by a long double chain that could be operated from the ground. The mill had a boat shaped cap, petticoat, gallery and 6 bladed fan. It is probable that the sixth floor was added just before the sails were changed. A bake office also operated on the same site. The tower was 53 feet high to the curb and the walls were 2 feet thick. The ground floor was 18 feet in diameter and had a two leaf door and 2 windows. The first floor had a 15 - 16 foot high ceiling and contained beams to support 2 pairs of underdriven stoines. The upright shaft ran from the the curb to the second floor. The windshaft had cast iron balance weights like muff couplings bolted to the rear section.The wallower was put into and out of gear with the brake wheel via two adjusting screw and shackles on top of the upright shaft. The great spur wheel had 9 T section arms. Also Messuage or Dwelling house with Baker’s shop etc. The above Property is all Freehold & situate in Great Ellingham aforesaid near the street in a populous neighbourhood being eligible for the trade of a Miller & Baker, requiring only a small capital & the Land is of first rate quality. Immediate possession may be given of the entirety of the premises except one of the cottages the tenant of which has had notice to quit at Michaelmas next. Apply to Mr. Spanton, Solr. Or the Auctioneer, Attleborough. 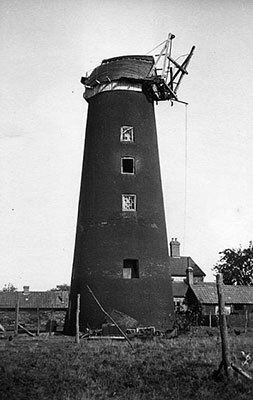 To be Sold or Let at a moderate Rent, together or separately a very desirable property situate at Great Ellingham comprising a newly erected TOWER WINDMILL consisting of five floors working one pair of stones with the sails & sail cloths thereto belonging late in the occupation of James Buck, together with a piece of land containing 0a. 1r. 23p. more or less. 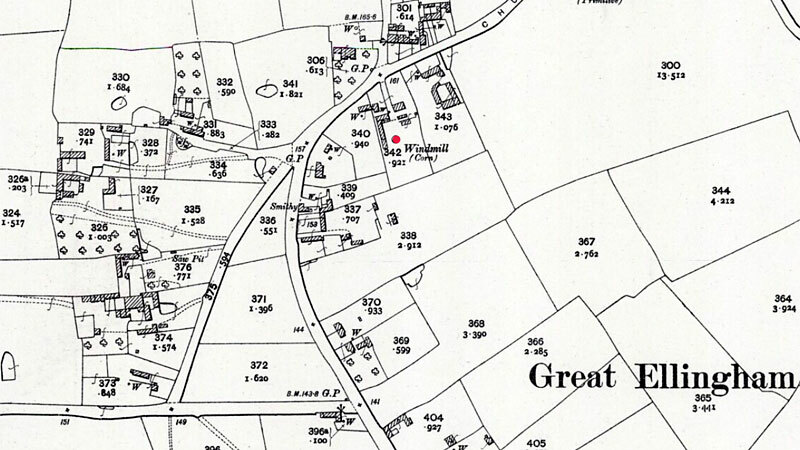 Also two Tenements or Cottages adjoining each other late in the respective occupation of the said James Buck & Frances Buck & a cottage in the tenure of Sophia When, with a small Barn near the same. Apply to Mr. Spanton, Solr. Or George W. Salter, Auctioneer, Attleborough. A TOWER WINDMILL & BAKE OFFICE to Let at Great Ellingham, 2 miles from the Attleboro' Station. Apply to Mr. S. Le Grice, Attleboro'. Norfolk News - 20th February 1869. To Let at Great Ellingham, a good TOWER WINDMILL & BAKE OFFICE, with immediate possession. Apply to Mr. S. Le Grice, Attleborough. For several years after the mill ceased working the advertisment Hovis Bread could still be read on the tower. By 1980, only the outer tower shell remained, with the house alongside. William Stackwood moved c.1867 to work at Horsham St Faith smockmill possibly as a result of the deaths of some of his family and the fact that he had been made bankrupt while at Gt Ellingham. Daughter Louisa Stackwood died in the 2nd quarter of 1863, Hannah Stackwood died in the 2nd quarter of 1866 aged 9 and his wife Elizabeth died in the 3rd quarter of 1866 aged 29. Robert Le Grice of Great Ellingham, miller, was charged by Thomas Fincham of Shropham, dealer, with assaulting him at Hockham on the 15 th inst and pleading guilty was fined 2s 6d and costs 17s 6d. Notice that a Building has become listed. 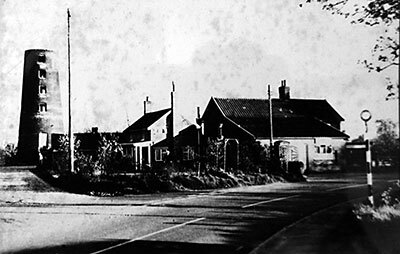 Building known as windmill, Long Street, Great Ellingham. 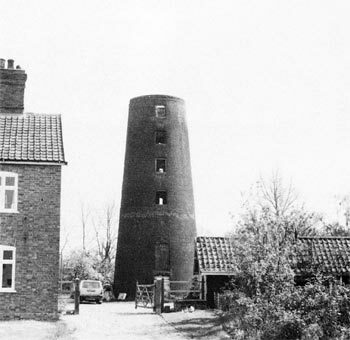 I found the website very interesting particularly the part on Gt Ellingham Towermill. My family have lived in the village for 250 years and my grandfather spent all his life there more or less. He wrote down a village history ... re the mill...it was made from bricks manufactured at the brickyard on Hingham Rd, Gt Ellingham by local builders and constructed without scaffolding. Coincidentally it was a Mr Scase who was the last baker and he made the most delicious bread! Sue Fay - 14th April 2008. A Norfolk couple could soon achieve a long-held ambition to convert a ruined windmill in the garden into a dream home for their family. Owners Janet and Michael May acquired the building when they bought their present home The Mill House, at Great Ellingham, more than 20 years ago. Dating from 1849, the tower mill originally had five storeys, a boatshaped cap and was 53ft tall. The sixth floor was a later addition and during its heyday a bake office also operated from the site, near Attleborough. 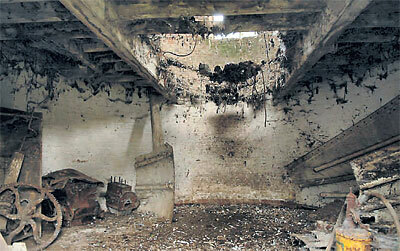 But over the centuries the mill fell into disrepair and was completely derelict when the Mays arrived on the scene. They were granted consent two years ago for the conversion, but an unforeseen problem with the positioning of an extension to the mill delayed the project. And the couple have just submitted modified plans for Breckland Council’s approval. Mrs May said: “We have been trying to get permission to do something with the building for 22 years. English Heritage have changed their policy and whereas in the past they had always hoped for restoration they decided it was derelict and capable of conversion. the design. The extension will be completely in sympathy with the tower, and after five or six years it will look like it’s always been there,” she said. The couple plan to sell their present home to fund the project, with the intention of moving into the neighbouring mill with sons John, 26, and Paul 23. “I’m not sure if it’s going to be a dream or a nightmare,” quipped Mr May, contemplating the months of work that lie ahead. “The first thing we had to do was make sure the extension didn’t clash with the mill. It will have wooden cladding on the outside and a traditional Norfolk tiled roof,” he said. The house will have environmental features such as a ground heat source pump to provide energy, high levels of insulation and low energy lighting. A wind turbine and solar panels have been ruled out as not in keeping with the mill which has two foot thick walls, so no extra insulation is needed in the original part of the building. The Mays are hoping to start work this autumn, if all goes well. Celia Wigg, Eastern Daily Press - 31st July 2008. Kelly's 1908: Ellis Carter, Chequers P.H.